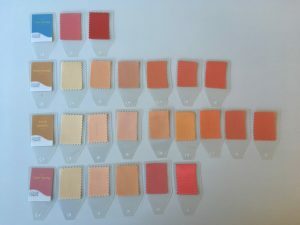 Which is the Best Color Orange for You? If orange is the new black, we might be in trouble! The color orange is polarizing as you either love it or hate it. This is most likely because it’s not an easy color to wear and absolutely does not look good on everyone. Orange is best left to those with warm skin tones – Autumns and Springs. However, orange color combinations can be used for just about anyone in small doses. What’s the best orange for you? Before we determine that, let’s talk a bit more about the color. Orange is made from red and yellow, so it blends the power and energy of red with the cheerfulness of yellow. This results in an energetic and stimulating color that evokes a sense of joy and creativity. It’s also seen as the color of changing seasons, so it’s a color of transition. The varied hues of orange also have varied meaning. Peach and coral are seen as friendly and soothing while red-orange is associated with passion or aggression. The gorgeous golden orange colors of fall are often associated with vitality and wealth. When you wear orange, you personify a feeling of vibrance, spontaneity, and adventure. We’ll start with Autumn, because it’s the season most associated with orange and true orange. 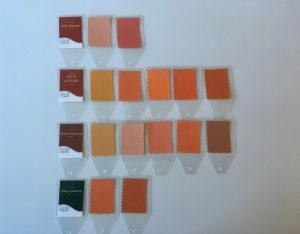 All Autumns have at least two versions of orange in their palette. Autumns receive a lot of orange in their palette, because it’s a beautiful color on warm skin tones. Autumns will do well in many versions of orange, but their best versions are the toasted oranges of fall versus the spring corals. Soft Autumns look lovely in the softer, pinker versions while True, Deep and Warm Autumns all get darker versions and look great in true orange. As a darker, cooler season, Winters do not look their best in any version of orange. Some Bright or Clear Winters, do well with bright coral. The orange equivalent of fuchsia. Like Winters, Summers do not receive any versions of orange, because it is simply too warm for them. Additionally, for Summers, orange is too intense. 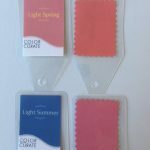 Light Summer, since it’s a lighter, brighter season than the other Summer seasons does receive a color called Coral Pink. This is basically a pink with some warmth in it and is not truly related to Orange. Compared to Light Spring’s Coral (left), you can see that it is much more pink than coral. If you’re wondering what color to wear with orange and/or how to wear orange if it’s not in your season, have no fear as it’s pretty easy to pair. For interest, try an analogous or complementary color scheme (see post on color schemes). Pairing orange with burgundy would be analogous while pairing it with blue would be complementary. Cobalt blue and true orange are often used for school colors, because it’s really energetic. If you’d like a more subtle version, then pairing orange with denim works great! If you are a Winter or Summer, then orange is a color that you probably avoid, but you can still have fun with it. For Winters, pairing a navy dress with an orange belt, purse, or shoes is a classy, but exciting combination. A more subdued combination, but that still provides drama to an outfit, is to pair your orange accessory with a wine or burgundy outfit. Summers have even more trouble with orange, because it’s often too vibrant for them along with being too warm. Summer’s best orange, as an accessory, is a muted coral or apricot. 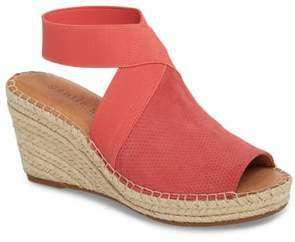 I like pairing coral shoes with a chambray dress – great combo for a Summer.The key for both Summers and Winters is to avoid orange near your face, so an orange belt, but not an orange scarf or sweater. How do you feel about orange and what are your favorite orange color combinations? I’d love to hear in the comments.